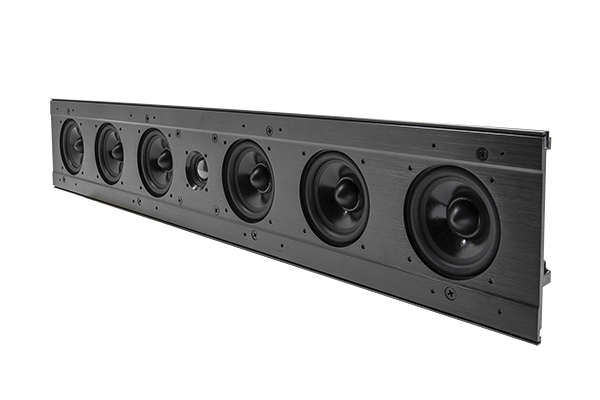 The EWSLA63 uses professional line array technology to efficiently transfer sound from the speaker to the listener. Since 1957 the best minds in the audio industry has been perfecting the line array design. Earthquake now takes the next step by implementing it into a stylish in-wall speaker. Resulting in the best sound that pro audio technology has to offer all while staying high end home audio poised and elegantly understated. Built entirely without compromise using exclusive materials and designed to last a lifetime. Space Age polymer cones, silk dome tweeters and rigid resonance free aircraft grade aluminium body frame guarantees high quality and extended durability. Line array technology is a direct way of sending sound wave from the speaker to the listener with minimum wall reflection. You listen to the music, not the room. 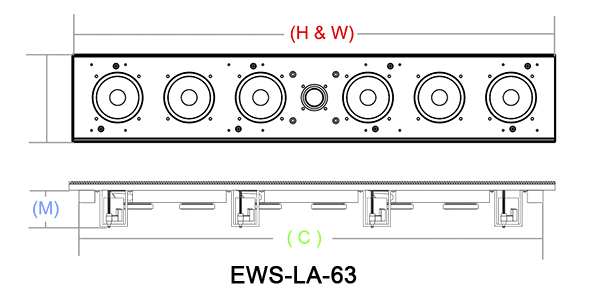 In a typical room, the EWSLA63 requires 4 times less power than a standard single source speaker to achieve the same sound pressure level at the listening position. As the power is reduced, so are room reflections and other acoustic artifacts.The EWSLA63 comprises an array of six 3-inch speakers that are positioned to minimum phase delineation. To ensure perfect integration in any room the Edgeless series have +/- 3dB adjustment switches to tailor the acoustics and magnetically removable paintable grills for color matching. A wide angle eye-ball tweeter mount enables precise and very flexible toe-in directivity adjustments for perfect integration. Build in Turn-n-Lock™ mounting mechanism makes installation a snap.